The Gospel of the Passion is God’s word……the Word on the cross. We need to contemplate and understand this Word, spoken to us in his passion, death and resurrection. Don’t be afraid to allow God’s word on the cross speak to us. 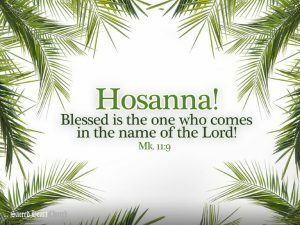 Palm Sunday inaugurates Holy Week which should be lived distinct from any other week in our lives. We are invited to follow Jesus in word and action. Here are a few ways we can do so: 1) Accompany Christ an hour in adoration at the Altar of Repose in the Narthex following the Holy Thursday mass. 2) Join the Mercy Mission Cross Walk departing Sacred Heart at 10:30 AM Good Friday to witness the gospel in the public square downtown. 3) Bring a fall away believer to the Good Friday Communion liturgy and the Easter Vigil mass. Live Holy Week as never before by being a disciple, not just a routine admirer. The Annual Holy Week Mercy Mission is coming to Sacred Heart April 17-20th. This is an opportunity to be a missionary on the streets of Calgary during the triduum. You can find more information and register online.